A journey through the past in the latest issue of Guitar Legends exploring the history of Neil Young’s long and distinguished career. Guitar Legends issue covers Young's work with CSNY, Buffalo Springfield, Crazy Horse, Pearl Jam and many others. Gold Rush: The complete story behind the making of Neil Young’s Archives Volume 1, 1963-1972, the most ambitious music anthology ever created. Ragged Glory: From his beat-up Les Paul to his vintage amps and effect pedals, Young’s stage rig is a road-worn tribute to his timeless sounds. Nils on Neil: Guitarist Nils Lofgren recalls his time playing with Neil Young on After the Gold Rush, Tonight’s the Night and beyond. Jam Session: On 1995’s Mirror Ball, Neil Young and his Pearl Jam protégés find that haste is much to their musical taste. In His Element: Neil Young comes home with his 2000 acoustic gem, Silver & Gold. Four Play: In this in-depth interview from the fall of 1999, Crosby, Stills, Nash & Young discuss the trials, tribulations and jubilation of reuniting one of rock’s greatest bands. Meet the Family: Neil Young introduced his 2003 concept album, Greendale, with a series of solo acoustic performances. Rider on the Storm: Young tells how he braved illness and tragedy to make the brilliant 2005 album Prairie Wind and looks back on a lifetime of acoustic guitar playing. His Old Guitars: Longtime Neil Young guitar tech Larry Cragg talks about his boss’ acoustic gear. Super Sonics: Solo? Absolutely. Acoustic? Hardly. With the help of producer Daniel Lanois, Neil Young plugged in and turned up on 2010’s shape-shifting Le Noise. More on Guitar Legends Magazine back issues. So why exactly is Neil Young a guitar legend? Just picked up this issue on a whim when I saw it at the drug store. There are some amazing photos in there that I've never seen before, and what looks to be some great articles within. Can't wait to get home tonight and do an in-depth reading. Wish I could find this in the UK - any ideas anyone? Wow, that's a GREAT photo of Neil. I guess it's from the Ragged Glory days. Kind of a refined, stylish version of that ragged hippie look he had going twenty years prior. This might be his manliest look ever, in fact. He looks like a lumberjack dressed up for a night out with the ladies, in that cool jacket and swift orange shirt. But all man, man. 100%. Looks like the 'unplugged' beard and jacket period just after RG. Hi Avalanche, I wish I knew! If I find out where it`s available I`ll let you know. Man, don't you just love it? 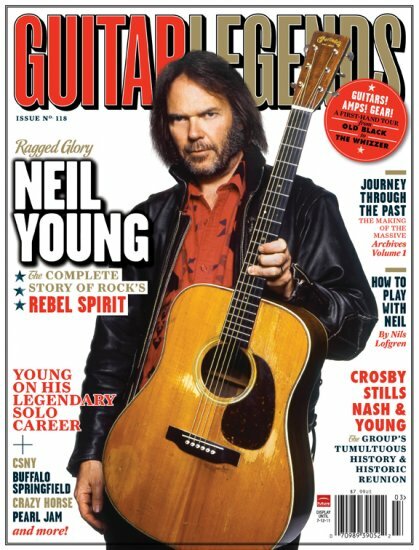 Neil on the cover of Guitar Legends Magazine! Anytime I'm at a magazine rack, the first thing I do is thumb through all of the music orientated magazines looking for anything Neil related. But to see him on the cover instead of Hendrix or Page or Clapton just makes my heart flutter just a bit. It's a fine line between ones recognition for accomplishments and over exposure, of which has never been an issue for Neil and his fans. Neil's fan base has thrived on word of mouth and from a fan turning on a friend to his music. It certainly hasn't been from radio airplay or promotion from his label. Neil has never had the 'payola blues', neither has Elliot ever been guilty of 'whoring out' his client. For Neil to be acknowledged at this level is based solely on his achievements as an artist that can't continue to be ignored. I'm sure that even his peers have asked "what about Neil?". Independant of the 'Media Machine', Neil has long ago achieved 'Super Star' status with a loyal fan base that I'm certain has made other artists green with envy. All of this came as a result of Neil staying true to himself and following his 'muse' regardless of whatever trend the other sheeple were chasing at the time. Now, as a result of his unwaivering integrity, accolades and rewards are finally coming his way, albeit too long overdue as far as this fan is concerned. Way overdue! @Bigchief - we hear you on this. kinda gets to the root of the whole matter -- the muse, the integrity.